America in Bloom judges are almost here and everyone has been pitching in to get the town ready for their arrival. 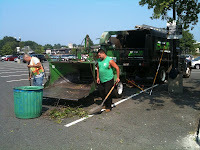 Caffrey Tree & Landscape has lent their services to tidy up Westfield. Workers have been weeding and mulching around the South Side Train Station. Dead branches and leaves are also being collected to keep the train station neat and clean. It is this type of community involvement that keeps Westfield beautiful!